Joseph Mallozzi's Weblog: August 28, 2011: Baby! My pug Maximus isn’t the only one struggling these days. Apparently, mom’s cat, Baby, is very ill and, sadly, on his last legs. Sad. Back in the day, he and Jelly used to play together when they were both much spritelier. Jelly would bound down the hallway and scatter the cats like bowling pins while Baby would scramble to avoid being tossed like a hapless matador. Hopefully, the two will get a chance to reconnect one last time before I head back to the west coast. An abbreviated blog entry today as I switch gears to finish up my latest rewrite of Payback. I’ve incorporated Director Bruce McDonald’s notes, lost the flashback sequences, and now have to tweak a little dialogue. Once that’s done, it’ll be smooooooooooooooth sailing! Previous Article August 27, 2011: Wvrst! Geek Fest! Please tell your mom I am so sorry about her kitty. I’m so sorry to hear about Baby, what a sweet kitty… Please tell your mom we send hugs. What a sad year it’s been. @Das: Glad to hear you’re all ok, was worried about your feral cats! Jelly used to play together when they were both much spritelier. Jelly would bound down the hallway and scatter the cats like bowling pins while Baby would scramble to avoid being tossed like a hapless matador. that would’ve been something to see. Awwww…poor Baby! How old is he? Please let your mom know we are thinking of her and her kitty. Very sorry to hear about Baby’s issues. Yes, please share that we care. yes, please extend some hugs to Baby from my two cats Tessa and Zazu.. and me too! Oh and they wanted to tell you that they send hugs to Maximus as well. They like dogs. I hope you have a better week coming up. You need it. OH, and I will continue to wait patiently for your reply about the Michael Shanks heckle fest…..
My sympathies to the Mallozzi family for all of the pet problems. It’s hard to bond so closely with critters, then be faced with the difference in life expectancy. Looking forward to a happy, if poignant, reunion with all the Mallozzi clan, two and four legged. Poor, sweet Baby. I’m sure she knows she is loved. Let your Mom and sister know that they and Baby are in our prayers as well. @Deni, yes, indeed a sad year in many respects. But none of us walk alone. I know what strength I claim comes from elsewhere and I’m thankful. Sorry to hear about baby. Did you get any of that rain from Irene? @das So how’s the homefront? All good or still don’t know. I’m headed off to dr. this a.m. Cellulitis (yes, again) is worse, ran 103 fever (almost as high as the 107 temperature here in Houston). He said yesterday (I know a doctor calling you back on a Sunday) that he would either admit me or we’d put in another PICC line & send me home with the antibiotic that worked before. Apparently this particular antibiotic is not working. So if I don’t post for a few days, assume I’m there. I don’t know if I’d have access to a local computer if I was admitted. You can love them for as long as they let us, our pets, or are we theirs. We do get attached, hugs to Baby and mom and sis. Go get the Payback stuff done so we can have another nice long blog, thanks for sharing. @PBMom: Please get better quickly! Sorry to hear about Baby! Baby looks so dignified and haughty, can’t imagine he would ever deign to befriend a pug. But we all do crazy things in our youth. Hugs to Baby, I’m glad he’ll be able to visit with the pugs. Sounds like you could use some good home cooking and time at home. To that end I recommend lots of popcorn and double feature of Colombiana and Conan; nothing beats the blues like roundhouse kicks and chops to the neck. It is sucky to watch our pets get old or sick. What did the Vet say about Baby? 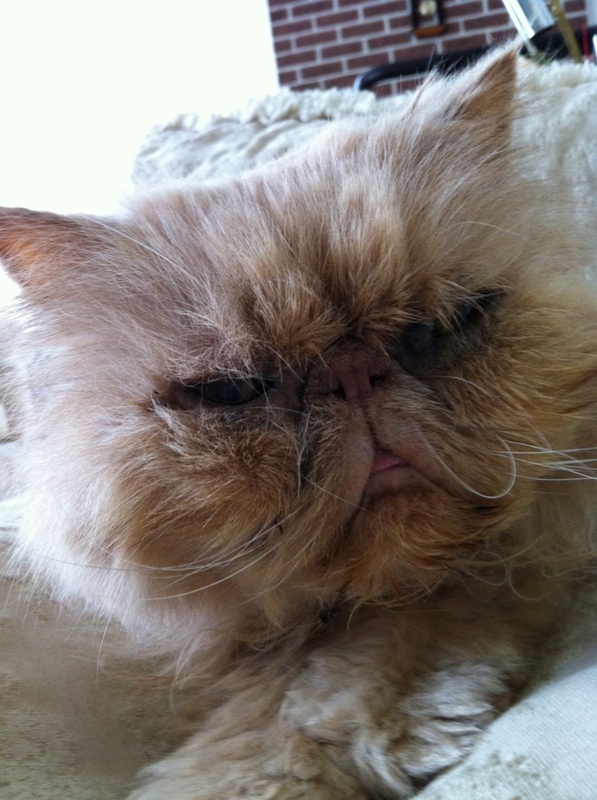 My vet friend has Persians and they look awful when they get sick. She keeps them going for a long time though. Her 15 year old cat, Romeo, is the sweetest cat but he looks like hell! His tongue sticks out all the time and he is so thin. Don’t give up on Baby until the vet does. Of course, that would be your mom’s choice and I’m sending hugs to her. It is tough making that decision for a loved one. Your mom has to do what she thinks is right. Ok, now I’m depressed. East Coast People: I’m glad everyone is reporting back with no damage! PBmom: Oh my, I hope you get some relief soon! I’ve never known anyone to have this much trouble from a spider bite. What kind of spider was it? I’m going to leave and go to Karate class. There is nothing like throwing some punches and kicks to help me get over a funk. Poor Baby. Poor Mrs.Mallozzi. Please let her know she is in our thoughts. Terrible traffic getting home (we went through Philly on the Schuylkill Expressway – a.k.a. the Surekill Crawlway), but still managed to get home in a timely fashion, around 2:30 pm. Totally exhausted, though. Cats are happy to be home, and we’ve seen all the ferals except one who isn’t a regular visitor in our yard, so I’m not too worried. Staches was hiding in the cat house we have outside our back door – he wasn’t coming out for anything! A couple trees down in the neighborhood, but mine are all still standing. Lots of branches and leaves all over, so will have to do some cleanup (and my lumberjack boys will have to come to clean up my big tree because there’s a lot of broken branches way high up), but nothing major. Funny thing is, the ‘strong’ trees lost branches, but the ‘delicate’ impatiens I have in pots all around my back yard didn’t lose a flower. For as much as it was nice to have a mini spur of the moment vacation, it’s even nicer to be home. Again, thanks to everyone for your concern and well-wishes. For those who think the storm didn’t have an impact on Jersey, at least one life was lost when a young woman’s car was swept off the road and submerged. It happened on one of the roads we had considered taking out of the state (albeit before any rain started falling), so that helped me appreciate that you don’t have to live around hills for flash floods to be deadly. I say that because we are so flat here in South Jersey, and most of our fresh water is stagnant, so it’s hard for us to imagine flowing streams strong enough to sweep away a car. Our biggest water threat is from the ocean and tides, so rainwater usually isn’t a threat. Shame that in this case it proved deadly.